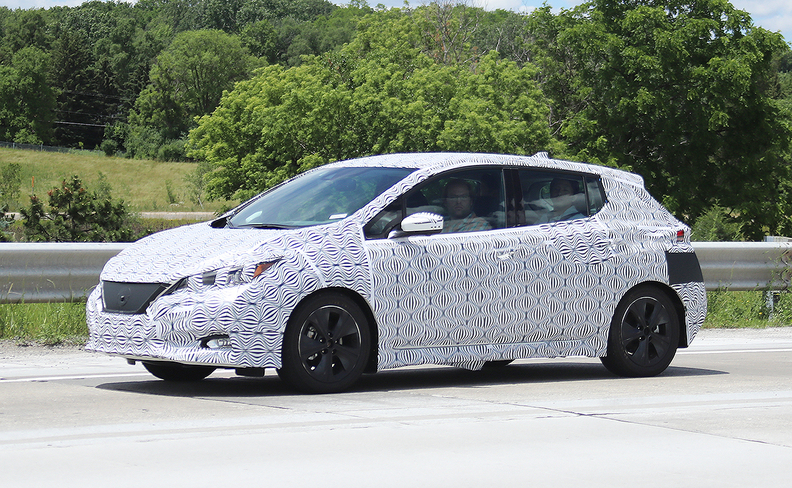 The new-generation Nissan Leaf spied recently. TOKYO -- Nissan will unveil push-button automatic-parking on the second-generation Leaf electric car as a new upgrade to its ProPilot autonomous driving system. The feature will allow the Leaf to self-park in parallel, angled, front-in and straight back-in spots by automatically taking over the accelerator, braking and steering, Nissan said. Dubbed ProPilot Park, it builds upon the base functions already included in Nissan's ProPilot systems on sale in Japan in the Serena family van and X-Trail crossover, known as the Rogue overseas. Nissan said the addition of self-parking "liberates drivers from one of the most tedious, and at times the most challenging, tasks of driving" and gives you confidence to "park perfectly." Nissan's ProPilot system is the first of a three-stage ramp up to urban autonomous driving in 2020. ProPilot enables single-lane semi-autonomous driving in highway conditions. It uses self-steering to keep the vehicle centered in the lane and guide it smoothly around curves. As part of its Intelligent Mobility strategy, Nissan plans to build upon ProPilot with a more advanced system due around 2018 that will allow automated driving across multiple lanes. The rollout will culminate in a sophisticated autonomous system that will allow "intersection autonomy" by around 2020. That function will allow cars to navigate city intersections and urban traffic without driver intervention, Nissan promises. Nissan had previously said the redesigned Leaf would get ProPilot. But this week's announcement details the system's further enhancement with automatic parking. The Japanese carmaker previewed how ProPilot Park works in an animated demo video. The driver cruises a lot for a parking spot, chooses a space and then presses the auto-park button. The car does the rest, piloting itself with sonar and cameras. "Hold down the ProPilot Park button with just one finger and glide effortlessly into your selected spot," the video says. "You get total confidence that even parking in the tightest space is completely automated and stress free." The video concludes by saying it will arrive with the new Leaf that premieres Sept. 6.